Library Assistant Anna Ostrowska shares with us some of her research for her recent Wellcome Library Insight Session. With current home birth rate in the UK standing at meagre 2.39%, it is easy to forget that less than a hundred years ago most British births took place at home. The figure was around 80% in the 1920s and dropped to 35% only in 1957, after hospital birth became both safe (sulpha drugs had proved effective against puerperal fever since the 1930s) and affordable. We consider that the resources of modern medicine should be available to all mothers and babies, and we think that sufficient facilities should be provided to allow for 100% hospital delivery. The greater safety of hospital confinement for mother and child justifies this objective. “The greater safety of hospital confinement” has not been supported by conclusive research and no-one asked the mothers where they would like to go into labour. There is an abundance of representations of home birth in the Wellcome Library, both historical and contemporary, and among other things they tell the story of changing attitudes towards pregnancy and birth. 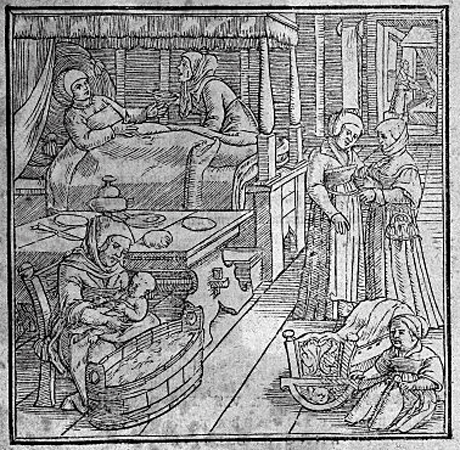 This image from Jakob Rueff’s De conceptu et generatione hominis…, published in 1554, is a typical sixteenth century lying-in scene with a bath and cradle. 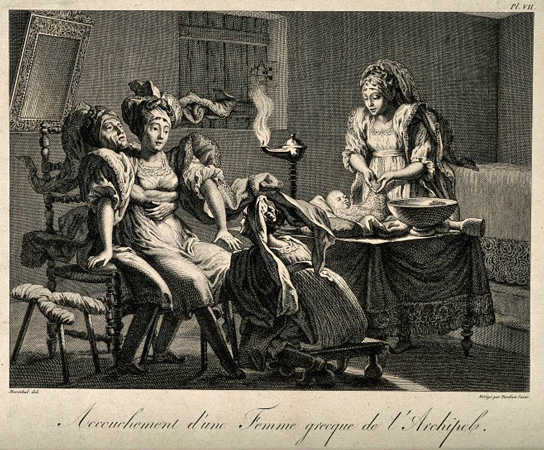 It depicts a ‘natural birth’: one given at home and normally in the company only of other women, traditionally seen as having special understanding of this female ‘mystery’. The women were mothers themselves and this experience legitimated their presence: having survived childbirth, they could provide both psychological and practical support to the woman in labour. The female midwife orchestrated the ceremony with considerable authority. Let’s make no mistake about it, some of the midwives could be quite bossy! You can read a previous Wellcome Library blog post on one contemporary depiction of a triumphant midwife here. That birth was indeed a women-only affair found its reflection in language. 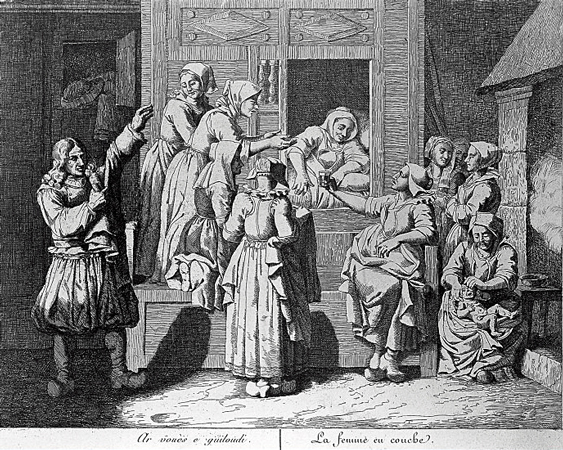 Until the seventeenth century no word existed to signify a male birth attendant and the modern word ‘obstetrician’ (first used in English in 1828) comes from the Latin word for a midwife, obstetrix. Perhaps not that surprisingly, when used as an adjective from the seventeenth century onwards, ’obstetrical’ was normally a metaphor pertaining to men ‘delivering’ ideas, texts or lectures. The frontispiece of another sixteenth century book, edited by Walther Ryff, Frawen Rosengarten. 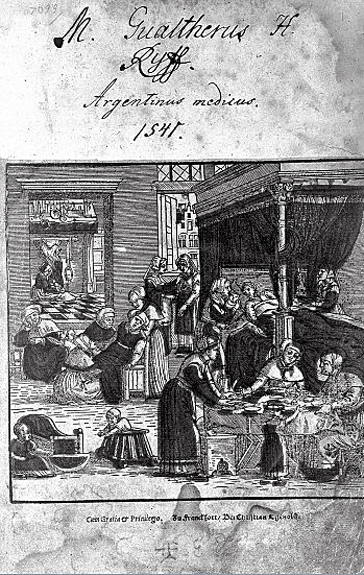 Von vilfaltigen sorglichen Zufällen und gebrechen der Mütter und Kinder… also reinforces the perception of birth as women-only event. 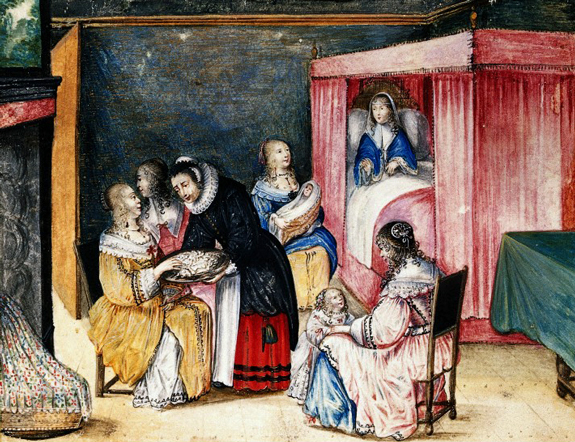 We can see a woman giving birth on a birth stool, assisted by the midwife, as well as another one lying in bed after delivery with a newborn baby on her side with curtains tucked back so we can see; in the front attendants are enjoying the meal; there is another child in a walker. On a closer inspection, this well-populated scene includes thirteen women, a newborn infant, four small children and no grown-up men. Interestingly enough, even today some midwives and mothers-to-be opt for removal of all men from the birth chamber. 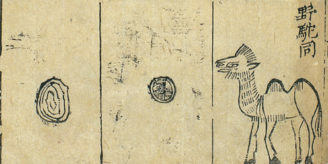 A birth-scene. Oil painting by a French (?) painter, Åbo, Sweden (later Turku, Finland), 1800. However, aside from husbands, male medical practitioners – as early as the second century AD – attended births. Unlike female midwives, whose job was to assist ‘nature taking its course’, they were present only at complicated births, especially when the child didn’t present head-first. A surgeon could perform a Caesarian section after a mother’s death or to remove a dead foetus, while physicians prescribed medicines. Male practitioners were thus associated with death or difficulty at births. 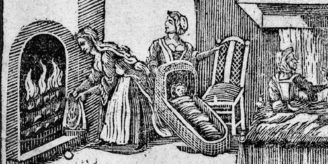 This perception changed with the onset of the ‘obstetric revolution’ in the seventeenth century and the appearance of the unseemly figure of the man-midwife.